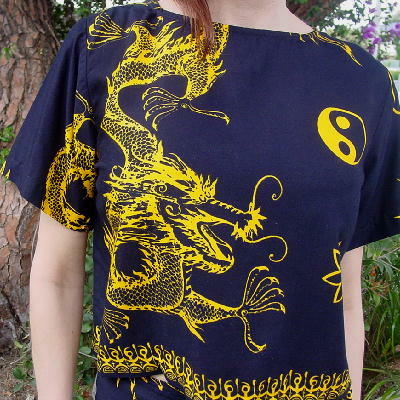 This 100% rayon top and skirt have a black background with a golden-dark yellow design pattern of a freeform dragon and other designs. The top has a wide neckline and short sleeves. The wrap skirt has a front wrap panel that is 1 5/8" narrower than the basic skirt with 17 1/2" long by 2 1/2" wide side ties. 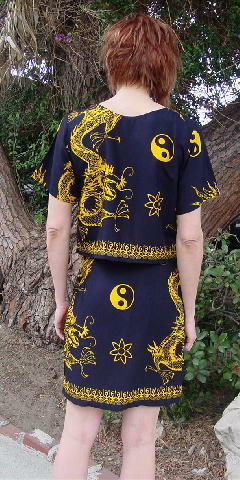 The top right waist area has a honey color button where the panels are buttoned together. The top fits like a size M and the skirt like a size S/M. They're by Patti & Marky and were made in Thailand. bottom hem side to side 20 1/2"